Enhance your home with high-quality vinyl flooring from the industry's top manufacturers. Our company carries an unmatched selection of products at unbeatable prices. We are a locally operated company that is committed to finding the best type of flooring for our clients and dedicated to creating a positive experience from beginning to end. Before you start your next remodeling project, visit our showroom and discover all the flooring possibilities available to you. 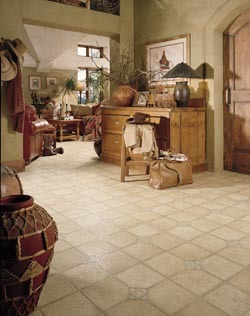 Vinyl tile is one of the most versatile and cost-effective flooring materials on the market. A vinyl tile floor is durable, waterproof, and easy to maintain. We offer a huge selection of vinyl tiles in a wide range of styles. Since it is a synthetic material, vinyl can be made to mimic virtually any other type of flooring. State-of-the-art manufacturing techniques are used to apply photo-realistic images of wood, stone, or ceramic tile to the surface of the vinyl. That means your vinyl tile floor can give the appearance of the most desirable luxury materials at a fraction of the cost. With the right training and equipment, vinyl floor installation is quick and easy. Our experienced installation team works quickly and carefully to deliver flawless results at affordable prices. We are proud of the quality of our work and we stand behind each and every installation. In addition, our vinyl floor installation services are very affordable. Don’t waste your time, energy, and money on a costly outside contractor or questionable do-it-yourself job. Let our staff handle every for you from start to finish at a price that is right. Vinyl is a durable material that will stand the test of time, so it's a great investment for any property owner. Unlike some other flooring products, vinyl flooring is water-resistant, so it can be installed in basements, bathrooms, and kitchens. The smooth surface resists scratches and is virtually impervious to spills and stains. With proper installation and routine maintenance, your new floor will continue to look great no matter what you throw at it. Our team of friendly, experienced flooring consultants is ready to assist you with every detail of your vinyl flooring remodeling project, from an initial design consultation to final installation. During your free consultation, we will listen to what you want and offer creative suggestions on getting the most out of your design. We then select top-notch flooring options based on the qualities that are most important to you, such as affordability, dirt and scratch resistance, ease of maintenance, and your personal style. After installation, we provide care tips that will keep your new floor looking its best for years to come. Vinyl flooring has numerous benefits for homeowners. They stand up to high impact accidents, making them great for families with children and pets. They are also one of the most comfortable surfaces you can install. Vinyl never feels cold, even in the middle of winter, and some vinyl tiles are padded for extra comfort. That means you can stand on them for long periods of time without feeling tired. Our vinyl flooring options include no-wax, urethane, and enhanced urethane. Each type offers different advantages. For example, enhanced urethane stands up to shoes, dirt, and cleaners, so it's great for entryways, kitchens, and bathrooms. Vinyl is extremely durable, but some basic maintenance will extend its life and protect your investment. Simply sweep or vacuum your floor tiles regularly and mop with a mild household cleaner. Make sure to rinse the floor after cleaning to remove any residue left by the detergent. Contact us to find out if vinyl flooring is right for you. We proudly serve Champaign, Urbana, Mahomet, Lake of the Woods, and Augerville, Illinois.